Our two week tour through Cambodia ended with a brief stay in the very small riverside town of Kampot. 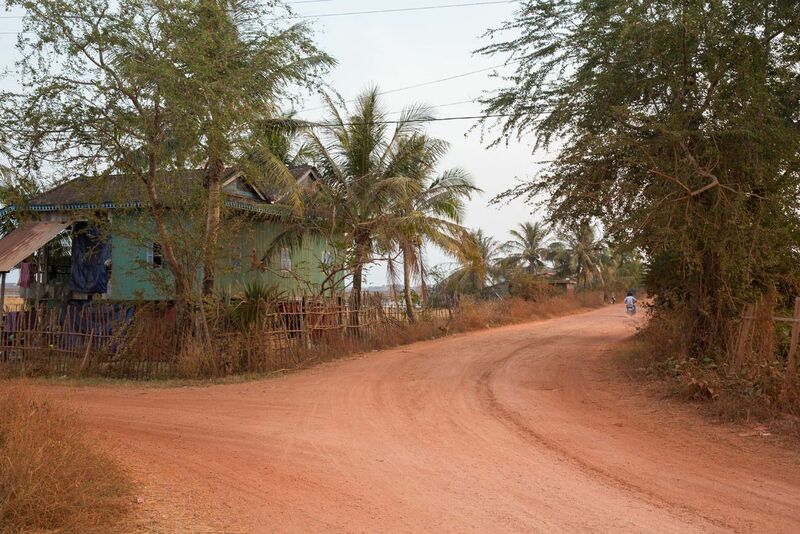 Of the three places we have visited in Cambodia, Kampot was by far the most laid back. 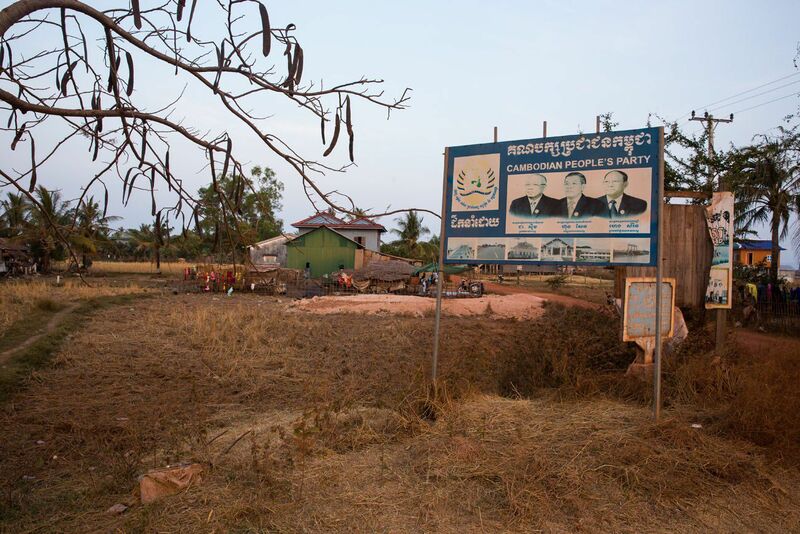 This town is located on the Preaek Tuek Chhu River (say that three times fast!) consisting of several blocks of small stores, restaurants, and hotels. 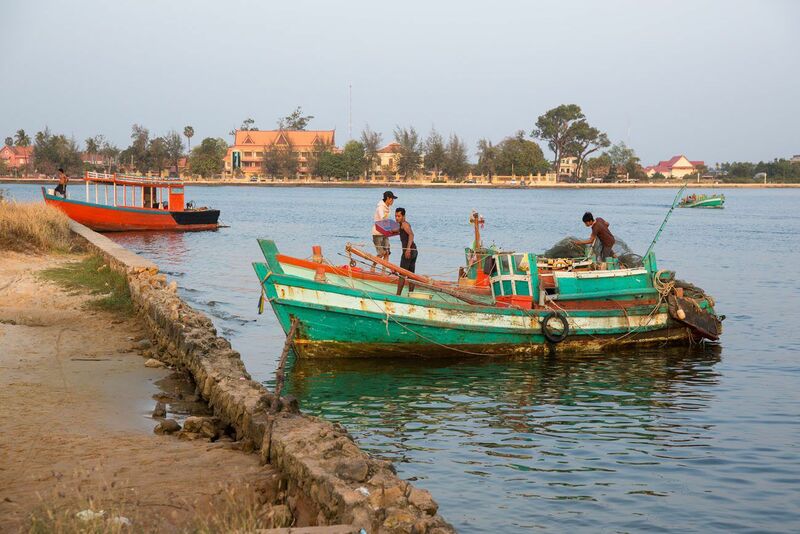 Surrounding the town are Cambodian fishing villages, farms, and salt fields. The draw for tourists is the laid back atmosphere, the scenery and sunsets, and nearby Bokor National Park. 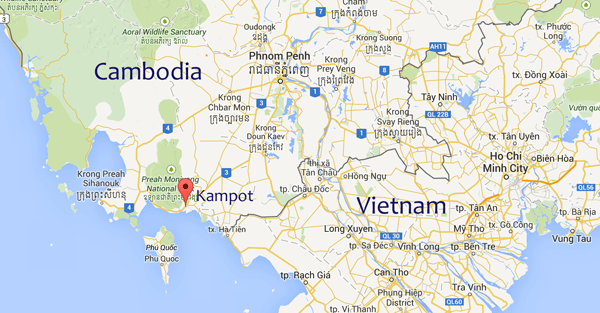 Kampot also is not far from the Cambodia Vietnam border, making it a convenient stop for people traveling on to Vietnam (like us!). Due to a slight schedule change, we ended up staying in two different hotels in Kampot. Stop number one was the Two Moons Hotel, a recently refurbished, small hotel with a swimming pool and views over Kampot. The four of us spent the afternoon here, enjoying the pool and the views from our room. The next morning we transferred to our second hotel, the Rikitikitavi, the place to stay in Kampot. The Rikitikitavi has a good central location, awesome rooms, good food, and staff that helped us plan our activities and even our transfer to Phu Quoc Island in Vietnam. All four of us loved it here. It’s amazing how much a TV with a DVD player has become a luxury for Tyler and Kara. Tim and I were big fans of the second level restaurant/bar and happy hour. 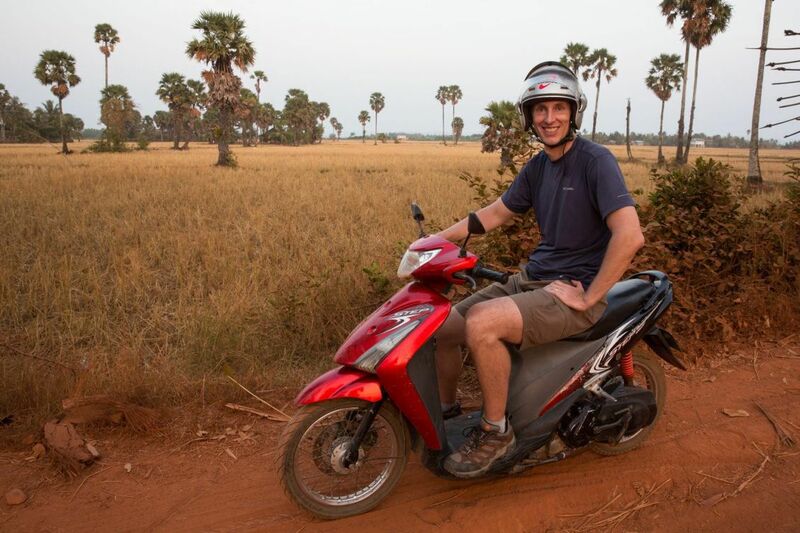 The most popular way to get around Cambodia is by motorbike. 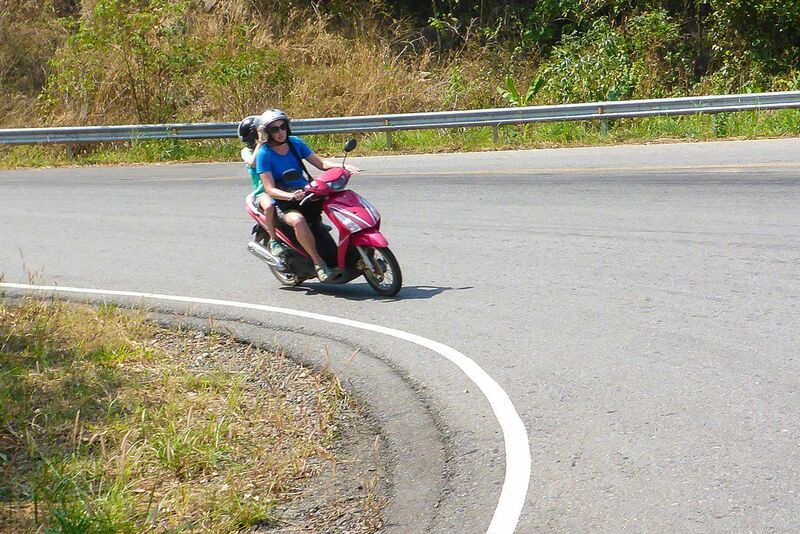 Tim and I decided to join in on the fun and rent motorbikes for two days while in Kampot. For just $5 a day per motorbike, this was cheap transportation as well as great entertainment. The last time Tim and I did something like this was almost fifteen years ago on the island of Bermuda. Tim and I loved it then, and this time it would be just as fun. Only this time, we’d each be driving with a backseat passenger. 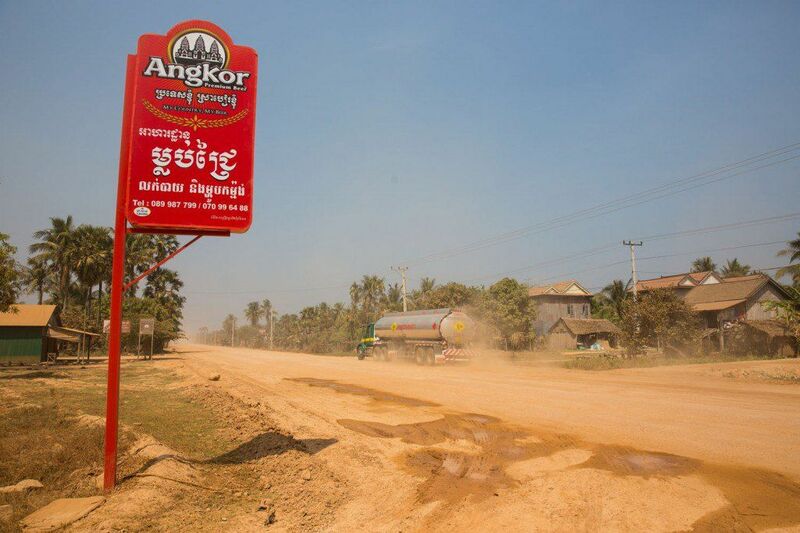 In Cambodia, people drive on the right hand side of the road. This was a good thing for us, of course. The hard thing to get used to was crossing through intersections without traffic signals or stop signs. Basically, you just follow the flow of traffic through the intersection, dodging other motorbikes coming towards you, while on the lookout for others who may suddenly pull out in front of you. In Cambodia, it appears that the cars pulling onto the road have the right of way. So, crossing intersections here is kind of like playing dodgeball on a motorbike. It sure did keep things interesting! The four of us drove out of town to Bokor National Park. From here we rode up winding roads and switchback turns to the top of Bokor Mountain. As we approached the top of the mountain, things got much cooler, a huge relief. 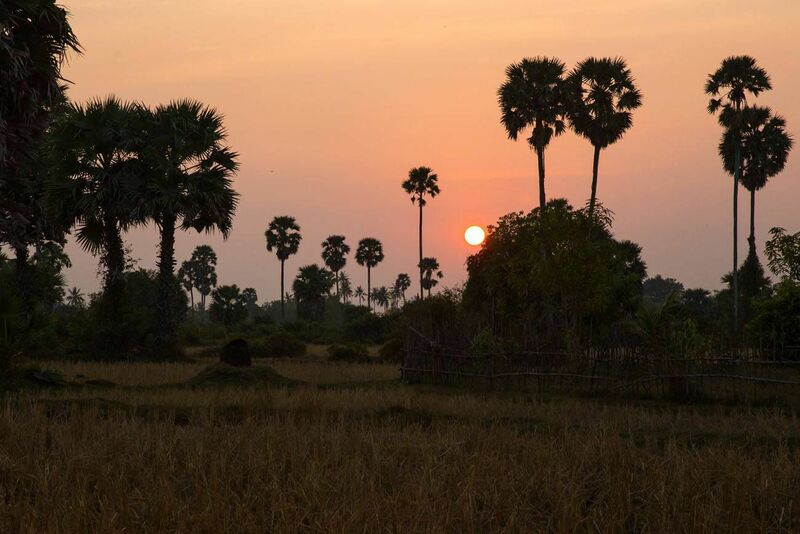 For being in Cambodia in the “cool season” it sure was hot…mid 90’s during the daytime, cooling off into the low 80’s at night. From the mountaintop I was expecting amazing views down to Kampot and out to Phu Quoc Island, but because of the haze, visibility was very limited. No big deal. Today’s fun was all about the journey by motorbike, not the destination. 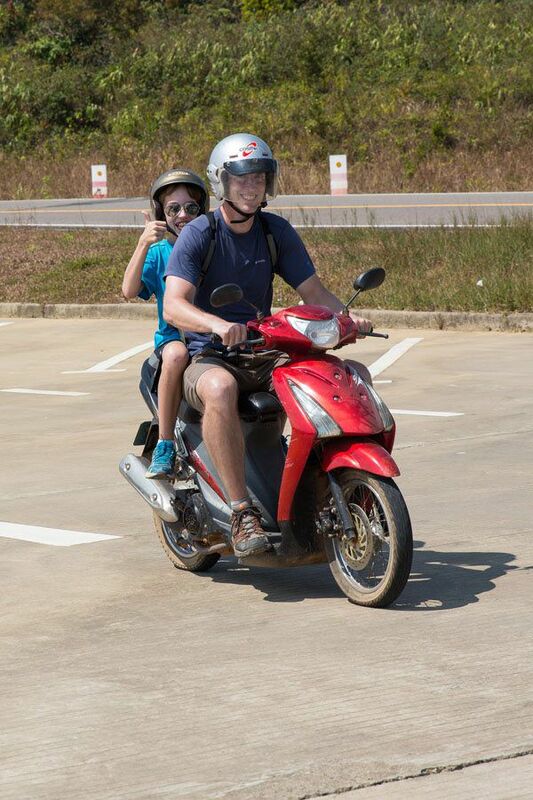 Tim and I were having a blast on these motorbikes and Tyler and Kara were having almost as much fun as our passengers! Later that same day, we left Tyler, Kara, and a Ferris Bueller DVD alone in our hotel room so that Tim and I could continue exploring Kampot on our own by motorbike. 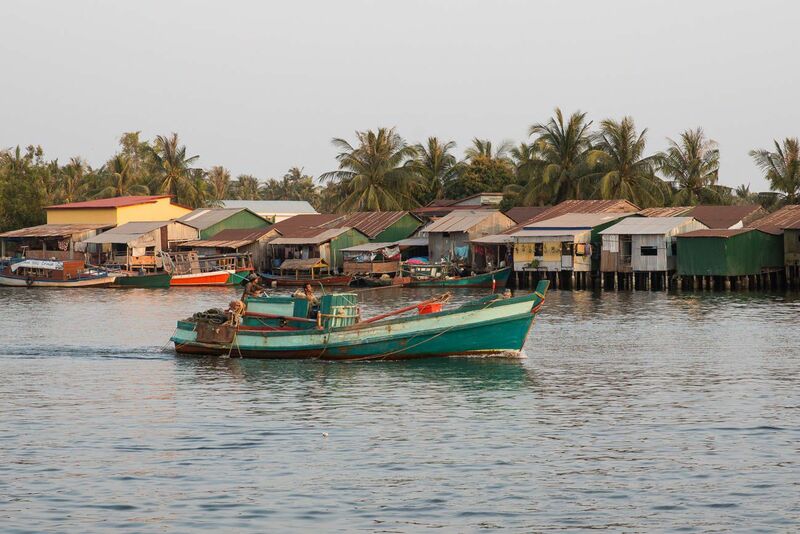 Across the river from the main town are small islands with fishing villages, farms, and salt farms to explore. 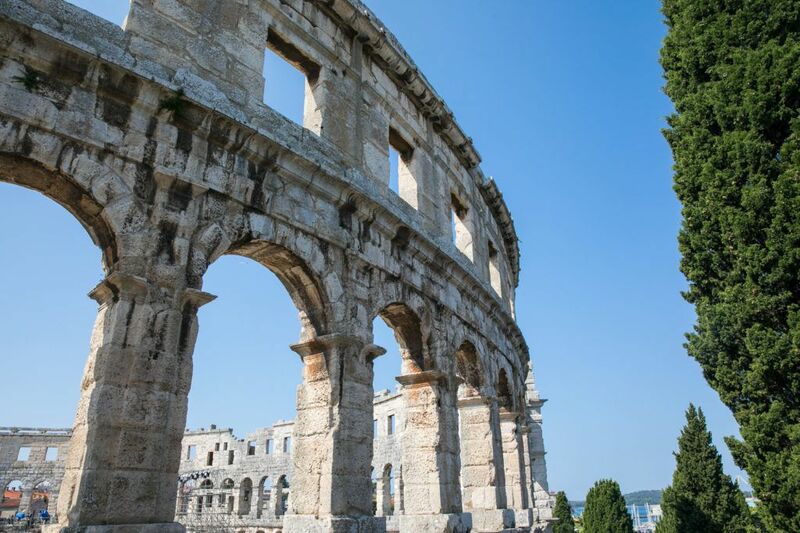 Again, it was tons of fun, and we are huge fans of venturing away from the touristy areas. 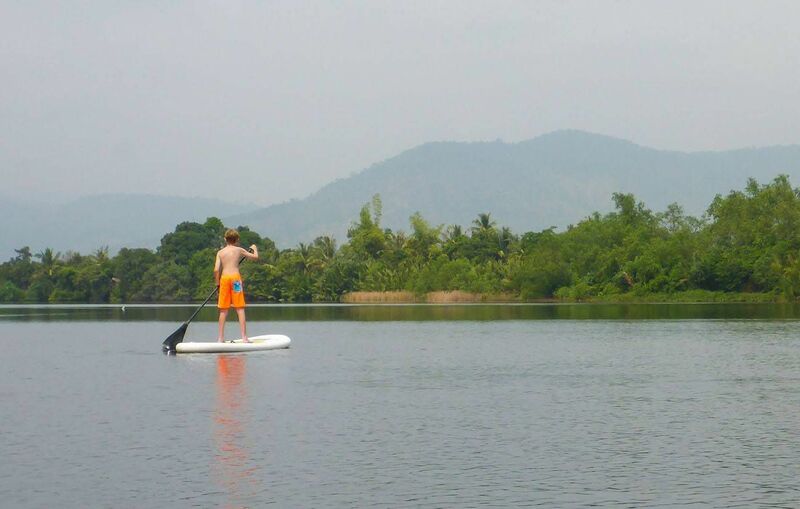 We spent our second day paddle boarding and kayaking on the river a few miles north of Kampot. This would be Tyler’s and Kara’s first time paddle boarding and they picked it up immediately. Tyler was zipping all over the place, using that Karate balance he has spent years practicing. Kara also did very well, but had some trouble with the steering. Several times she needed to be rescued from shore. The paddle boards were much more fun than the kayaks, and unfortunately the rental facility only had two paddle boards. So it became a fight for the paddle boards, as Tyler and Kara kept trying to steal them away from Tim and I. 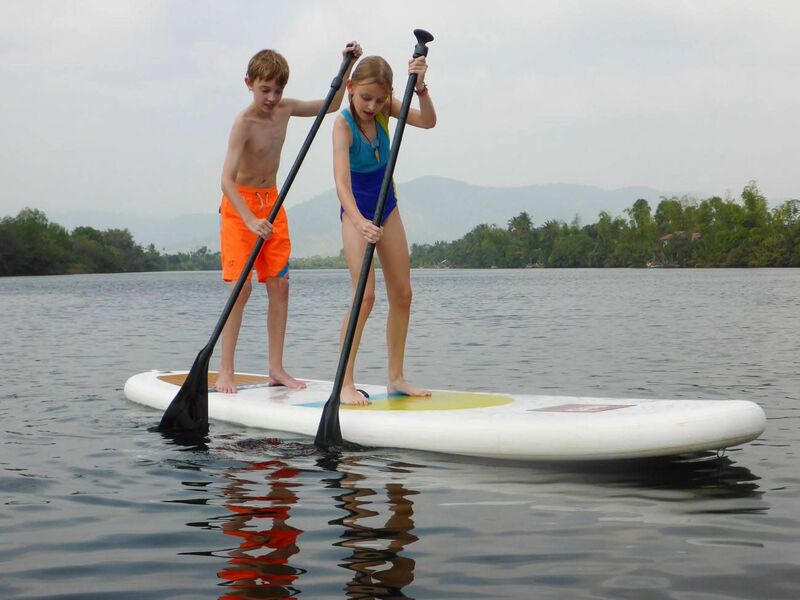 Playing chicken on paddle boards with your kids on a Cambodian river…priceless. Our stay in Kampot was just long enough. 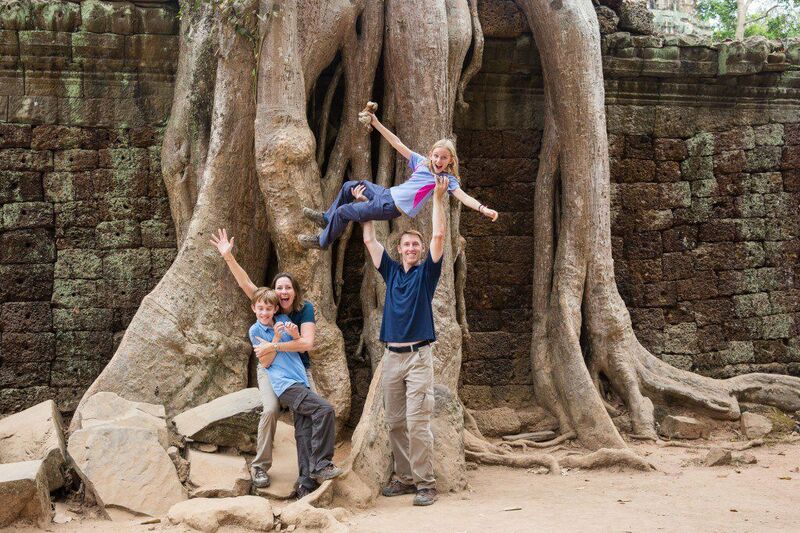 It’s a small place with a limited number of activities to do, but by coming here we got to see a little bit more of Cambodia. Renting the motorbikes and paddle boards was lots of fun for all four of us and a good break from the city and temple sightseeing that we have been doing so much. 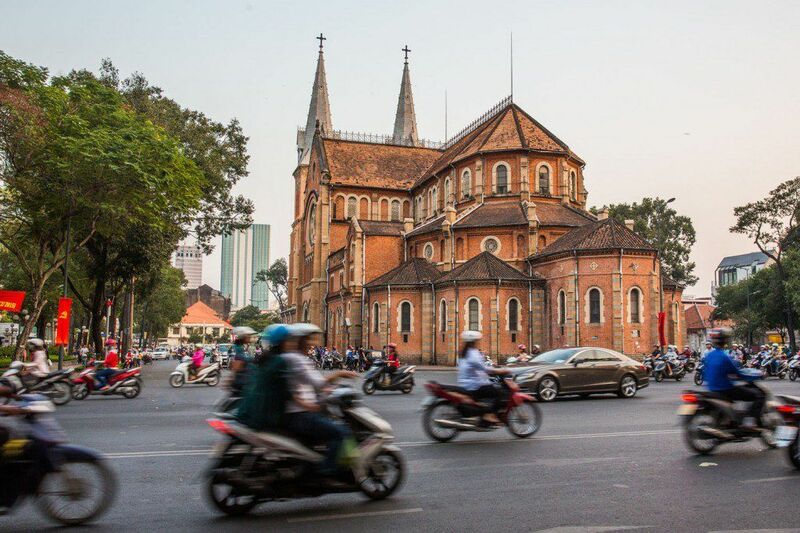 And now it is time to move on to another new country, Vietnam. We are so excited! Hi: You certainly had a lot of fun!! Re the motorbikes: During your trip you rented motorbikes in a couple of places. Did you always rent them thru the hotel you were staying at? If not, where? Is proof of a drivers license needed in any of the countries in southeast Asia? Thank you. 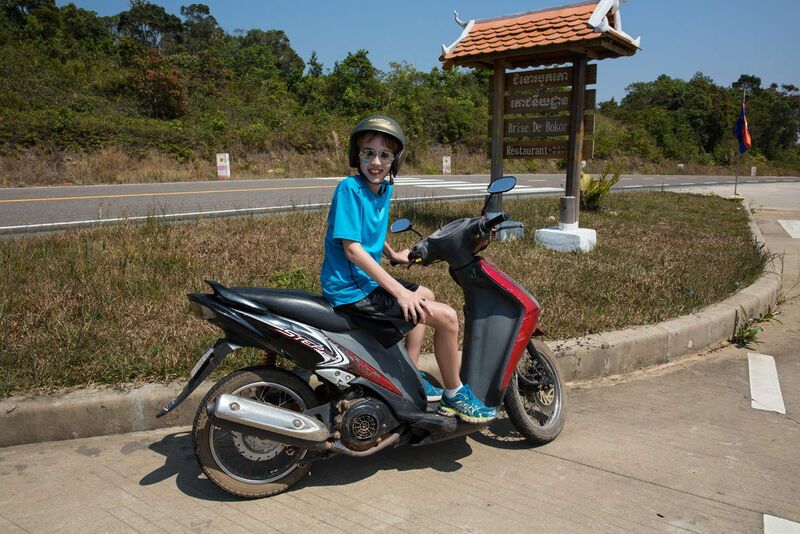 Regarding the moto’s, if I had and Australian car licence would that enable me to hire a scooter to take up Mt Bokor? We rented motorbikes directly through our hotel, the Rikitikitavi. We did not need to provide any proof of a driver’s license. They had our passport info, which I think is all they needed to rent us the motorbikes. It wasn’t even a law that you needed to wear a helmet. So yes, your Australian car license should be more than enough! Hi! 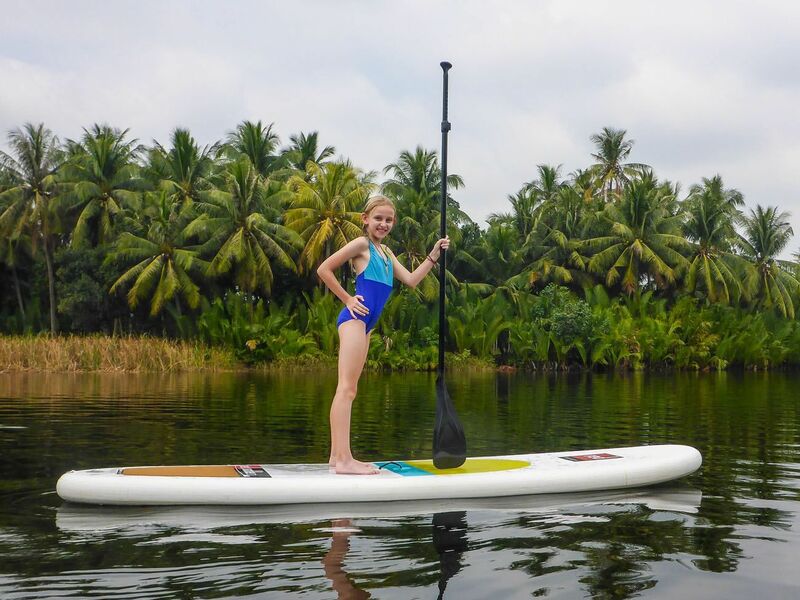 How much is the paddle board cost you? If I remember correctly, it was just a few US dollars per paddle board. I have followed you since day one. And I keep your postings to read when I have extra time. I am on Vaca in ️Costa Rica and have enjoyed reading about your travels while on the beach. Continue safe travel and good health.